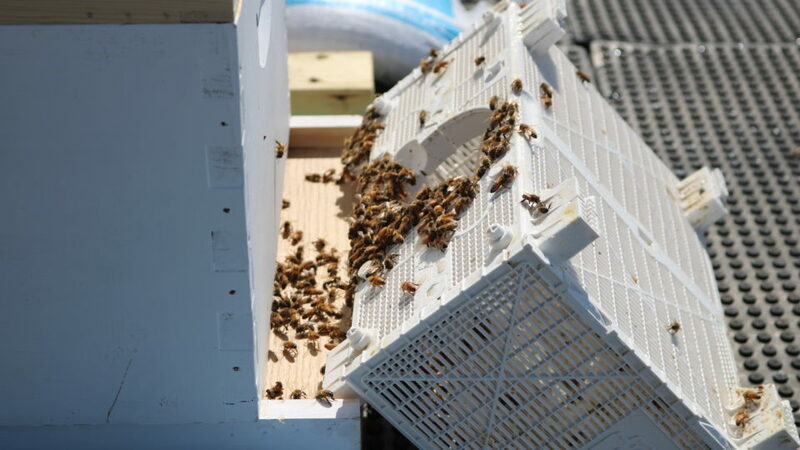 Second installment of a two part article about Kraus-Anderson’s Urban Honey Bees. For the first part please CLICK HERE. Why is KA getting involved with bees? BRENDAN WARD, PROJECT COORDINATOR & KA BUZZ SQUAD CHAIR: Bees/pollinators dying off rapidly over the past decade is a serious environmental concern for so many reasons. We need bees for so many things so to have the opportunity to add to the population in our city makes a huge difference. I think it all comes back to our commitment to strengthening the communities that surround us. What were the safety Concerns? And how has KA addressed them? WARD: This has been one of our main concerns since the project started. We have plans to hang signs around the 5th floor deck area notifying people of general things to be mindful of with bees. Also some informational sessions will be held to educate our KA staff of how to behave and what to look for when bees are around. We have also met with the safety department to make sure that the bee garden on the roof meets all OSHA standards for roof occupancy. Talk about the considerations in the orientation/direction of where the hives were placed on the roof. WARD: Our first spot on the north side of the mechanical equipment on the roof was unusable because the building engineer needed to work over there to maintain the building HVAC stuff. SO we chose the other side, which has been convenient because it’s south facing and will be the best for our garden. 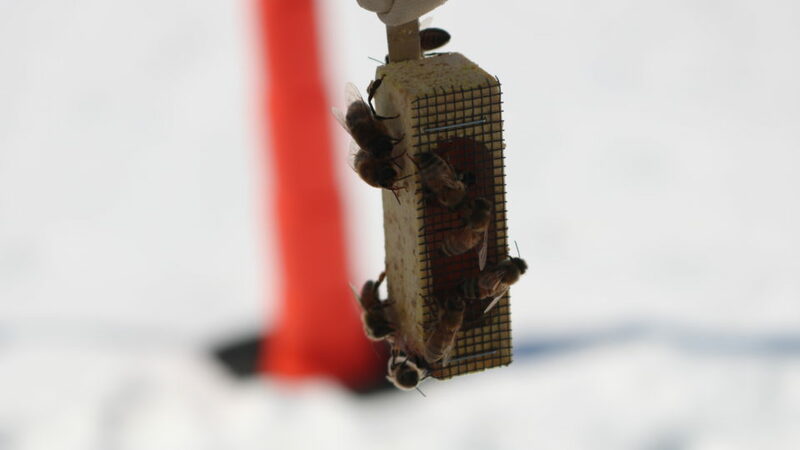 How will the Buzz Squad be able to measure the health of the bees? WARD: We are conducting weekly inspections to evaluate the health and function of each hive. We will use information from books and the web to compare and document how the hive is doing. 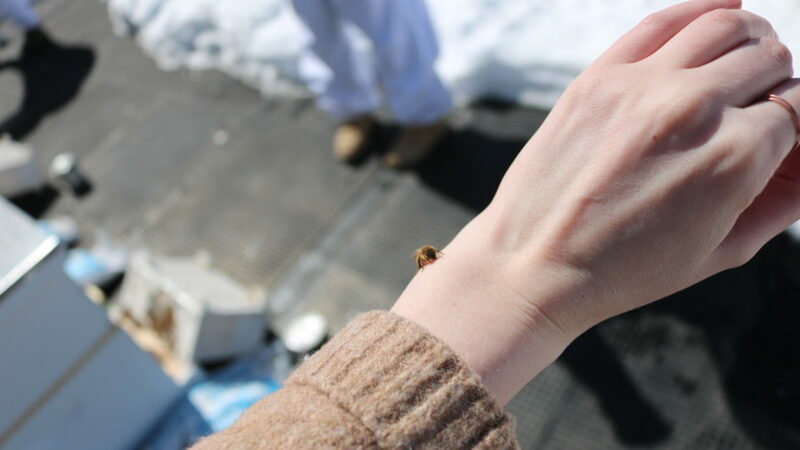 How do you address employees’ concerns or fear of bees? DEBBIE JOHNSON, Senior Project Coordinator and Buzz Squad Member: We have had various learning sessions where employees can come learn about the bees and the hives but to also ask questions and address their concerns. We actually have a few committee members who suffer from apiphobia (fear of bees) myself included, but we wanted to be on the committee because we believe in the sustainability effort that KA is making. I’ve found that the more knowledgeable I have become about honey bees the more comfortable I have become around them. I’ve also become more observant of who I am dealing with, a honey bee, most likely a worker bee who really doesn’t want to cause me any harm, she is just looking for pollen. Versus a wasp… Whom I have learned to identify and avoid! So far, what’s been the KA employee response to the bee project? WARD: Everybody has been so excited. Its been really neat to be a part of and consider myself so lucky to be working for a company that would do a project like this. We have held a few learning opportunities and educational sessions for employees which has brought both awareness of the need for bees and helped reduce the fear and common stereotype that bees are mean and will sting you. What kinds of plants will be on the rooftop garden? The KA bees enjoy pollinator-friendly organic herbs and bee baths. 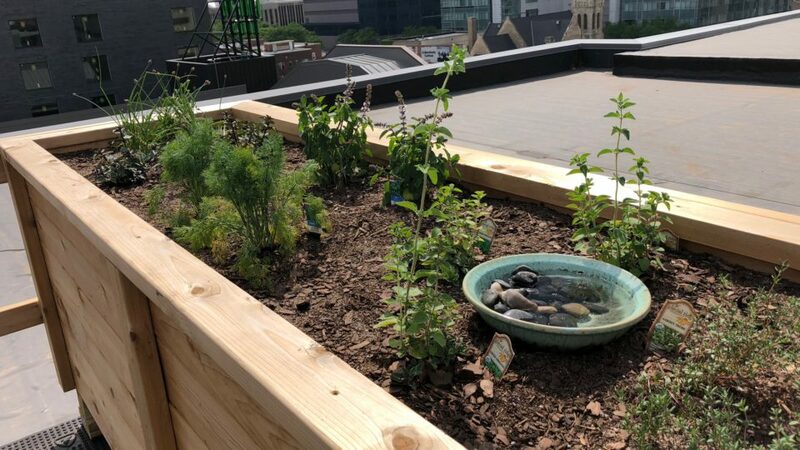 TONYA KOSTICK, EXECUTIVE ASSISTANT AND BUZZ SQUAD MEMBER: The plants in our rooftop garden were carefully selected based on research by our group. We wanted plants that were good for the bees overall health and immune system, so we chose things like lemon grass, mint, thyme and other herbs. We also wanted to include plants that honey bees are attracted to so we chose plants that are native perennials like butterfly weed, salvia, coneflower, and various perennial options with a few annuals. It is also important to note that when buying plants, you should look for untreated and pesticide-free flowers as much as possible. Chemicals, especially insecticides/pesticides containing neonicotinoids are a contributing factor in the decline of honey bees, so going the most natural route possible was our number one goal when selecting both our plants and who we were buying from. KOSTICK: The planters will have drain tile and a water reservoir system so that they only need to be filled roughly once per week. So pretty much because the planter will hold water, the plants will always have the perfect saturation, with excess draining through the drain tile. What is the Buzz Squad’s goal for this project? BUZZ SQUAD MEMBERS: Our goal for this project is fourfold, with the first and most obvious goal being that we have three successful bee hives that are able to live, thrive and pollinate in our urban environment. Second, KA cares about sustainability, and this is just one of our many contributions to the sustainability efforts. Third, we want to promote all the good that honey bees do, how they help our environment and that we need them in order to survive. If honey bees continue to die off our food resources and production will see a significant decline. And lastly, we want to educate not only our own employees but the communities that we serve. We want to be a leader in the #UrbanBees effort. We want our communities to know the benefits of beekeeping and how rewarding it is to be a part of.